Answer: Giuseppe Mazzini was an Italian revolutionary. He was born in 1807. He became a member of the secret society of the Carbonari. When he was 24 years old, he was sent into exile in 1831 for attempting a revolution in Liguria. After that, he founded two more underground societies; first Young Italy in Marseilles and then Young Europe in Berne. Mazzini believed that God had intended nations to be the natural units of mankind. So Italy had to be forged into a single unified republic instead of being a patchwork of small state kingdoms. Following in the footsteps of Mazzini, many secret societies were set up Germany, France, Switzerland and Poland. The Conservatives feared Mazzini. 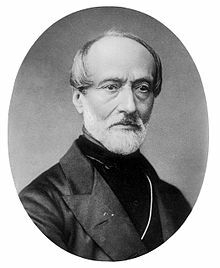 Giuseppe Mazzini (Italian pronunciation: [dʒuˈzɛppe matˈtsiːni]; 22 June 1805 – 10 March 1872), was an Italian politician, journalist and activist for theunification of Italy. His efforts helped bring about the independent and unified Italy in place of the several separate states, many dominated by foreign powers, that existed until the 19th century.